I grew up in Philly. In my junior year of High School, we moved from Fox Chase to Glenside near the Abington High School. Nearby is the intersection of Susquehanna Road and Old York Road, which we would often pass by headed to do the things everyday life requires us to do. Every time we sat at the light, my attention was always drawn to a grand church along Old York Road. This church was the Abington Presbyterian Church. 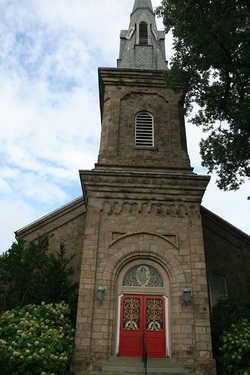 The Church was founded in 1714, which makes this Church is the third oldest Presbyterian church in Pennsylvania. Originally services in the home of Malachi Jones until 1719 when Mr. Jones sold to the trustees one half acre of his farm "to build a House for the Publick Worship of God And also a place for Burying the Dead." this house of worship and it is believed that this first church was built of logs to enable the rapid completion. The church was located in the center of the Burying Ground, which is now the Abington Cemetery. During the Revolutionary war several times during the occupation of Philadelphia the British would make raids into the country side. On at least one occasion the British marched up Old York road, only to be repulsed by Patriots entrenched behind the walls of the graveyard. In regards to the paranormal, it is said a ghost of a small child is said to haunt this historic church. The story goes, A graveyard was removed in order to build the church in 1779. The displaced occupants of the graveyard were then placed next to the new church. Ever since then people have reported seeing an apparition of a small child looking in the windows especially at night. It has also been reported that the child will also make appearances during prayers. Historically the 1714 church was built on the east side of Old York road surrounded by the Graveyard. In 1793 a new church was built on the West side (current location) of the road and the old wooden church dismantled. It was "a very homely old church solidly built but devoid of architectural beauty." Services began in the morning and lasted until 2 pm. notable people like John Wanamaker and President Benjamin Harrison have all worshiped here. The current church was rebuilt in 1833 using the stones from the old church, and possibly the timber from the first church. This is the church we have pictured and in the album. We are not sure who the boy is reputed to be. We have talked to several people who have had experiences, but nothing has been documented.